There is nothing better for a road trip from the north of Spain to the south than to pick up a rental car at Gerona (GRO) airport. On our independent comparison portal you can compare the offers of the car rental companies at Gerona Airport before you start your holiday. Find a cheap rental car quickly and conveniently, which will be ready for you on arrival at Gerona airport. You can also book additional insurance, extras such as navigation devices or child seats and much more. Gerona is located in the province of Catalonia in Spain. The city has an airport, so many tourists use it only as a stopover. But visiting this city is also worthwhile, as there are many beautiful sights here. Gerona is located in the north of Barcelona. The airport is located about eight kilometers from the city, which is called "Girona" by the Catalan. The old town of Girona is particularly beautiful. The town is located in the background of the Costa Brava and has narrow winding lanes with cobblestone paved streets. If you go for a walk here, comfortable and flat shoes are recommended. Gerona is quieter than Barcelona. Visit the Banys Arabs, which are public baths built in the 13th century by the Moors. They are still in operation today, but bathing is no longer possible there. However, you can visit them for a low price. With your rental car, which you can pick up at the airport pick-up point, you will explore not only the city but the entire Costa Brava. Located at the airport of Gerona (GRO), five bars and restaurants are at your disposal, where you can sit comfortably. There is a beer garden here, but only accessible to passengers. You will not only get snacks, but also cold drinks. Outside is the Food Gallery, which is open 24 hours a day and provides you with delicious drinks and food. At GRO airport there are two more restaurants called Medas and La Terraza. A visit there is also worthwhile. There are ATMs all over the airport grounds. Exchange offices are also on the spot, but the single currency, the euro, hardly ever visits them. You can surf the Internet at Gerona Airport. The computers are located at the various multimedia stations. You can shop in the five stores and shops. There are two supermarkets, a bookstore and a magazine store with international and national magazines. Aldeasa also owns two multi-shops at the airport where you can buy a wide variety of everyday items. Go to the car hire counter and pick up your rental car to explore Girona, Barcelona and the Costa Brava in Spain. Here you can rent a car online cheaply. The handicapped-accessible facility at Gerona Airport is particularly commendable and proves to be exemplary. It was built completely barrier-free. In addition, well-trained and friendly staff will take care of all passengers who need help at Gerona Airport. If you would like to take advantage of this offer, you should register two days before your trip. Afterwards you will be taken to the car hire service, where you can pick up your rental car and drive to the hotel, the sights or Barcelona. If your luggage is lost, you can turn to three different local lost and found offices. You can collect your luggage from one of the baggage carousels assigned to you by your staff. Depending on the flight, you will be taken to different baggage carousels. After you return your luggage, go to the Girona Airport car hire office and pick up your rental car at the airport. Rent a rental car cheaply and flexibly to stay independent from companies in Gerona and Barcelona. At Girona Airport there are six different counters in the car rental area. These include Europcar, Avis, Atesa, Hertz, AurigaCrown Car Hire and Goldcar Rental. The car rental counters are located in the arrival area of the airport and are signposted everywhere. Follow the instructions after picking up your luggage. At the car rental counter, you can take care of all the necessary formalities and find out where the pick-up station for your rental car is located. It is recommended to rent your car cheaply online before the flight. Where is the pick-up point of the car rental? Where the pick-up point of your car rental company is located, where you will receive your rental car, you can either find out in advance on the Internet or ask an airport employee to explain yourself on the spot. Frequently, they will also accompany you to the pick-up station to provide you with the latest information about the reserved car. Rent a rental car for less and discover the beauty of the Costa Brava. Which tank regulations apply to your Rental Car? The exact tank regulations of the individual car rental companies can be found in the offers. So that you can return the car to the car rental company with a full tank of fuel, there is a gas station on the motorway to Barcelona shortly before you leave for Gerona. However, there is no petrol station on the airport site itself. Coming from the A2 motorway, drive past the airport and take the next exit. There you will already see the desired petrol station. If necessary, you can fill up your rental car there and then drive to the sights of the city and the surrounding area. Rent a cheap rental car at the car hire company of your choice and travel comfortably and flexibly through Girona and the surrounding area. The N-II, C-25 and AP-7 roads will take you to all the towns and villages around Gerona. 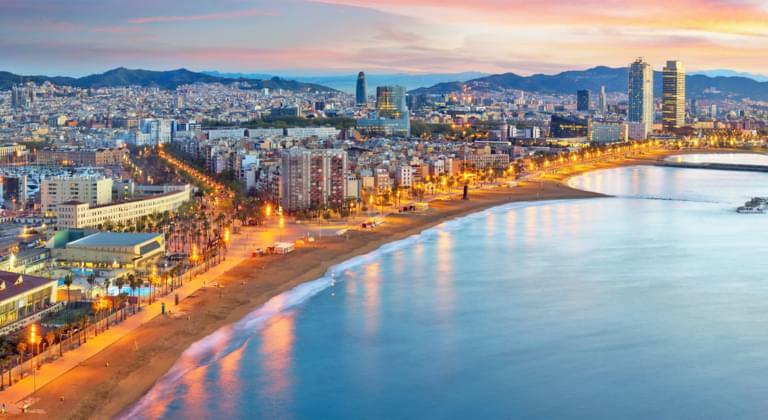 With your rental car you will not only reach all the city's attractions comfortably, but you can also travel with it to Barcelona and the coastal towns on the Costa Brava. You can book your rental car online. What are the special features of road transport in Spain? The roads in Spain are very well developed. The signposting of towns and villages is also excellent. In Spain, seat belts are compulsory, so don't forget to fasten your seatbelt when you are travelling by car. The driver must not make any phone calls while driving. The alcohol limit is specified as 0.5. You should therefore leave your rental car at home when you try the delicious Spanish wine or other alcoholic beverages. Rent a rental car and pick it up at Gerone Airport (GRO). Then discover the sights of Girona. If you want to discover Gerona with your rental car that you picked up at the airport, don't miss the Cathedral of Santa Maria, which is a popular photo motif for tourists. Behind it is the town wall, which is still in good condition. If you want to see Girona from a different angle, you should drive to Passeig de la Muralla, which is open from 8 am to 10 pm. You can also take part in guided tours of Girona. A very interesting variation is the Jewish quarter. With your car it is of course also possible to make a detour to Barcelona. Rent the vehicle you want to rent and go on a discovery tour through northern Spain. There are many shops and restaurants in Girona. The restaurant "El Celler de Can Roca" is an insider's tip. It was awarded a Michelin star. High-class cuisine is also available in the restaurant with the German name "München". Here you will find regional and Mediterranean dishes. If you like shopping, Gerona is also a great place to go. Close to the motorway on the outskirts of the city there is a shopping centre with over 100 shops. Here you can buy clothing of many brands, which you can buy at reasonable prices. Parking is free of charge in the underground car park of the center. Pick up your rental car at the pick-up point of the car rental company, which you could rent online at a reasonable price.